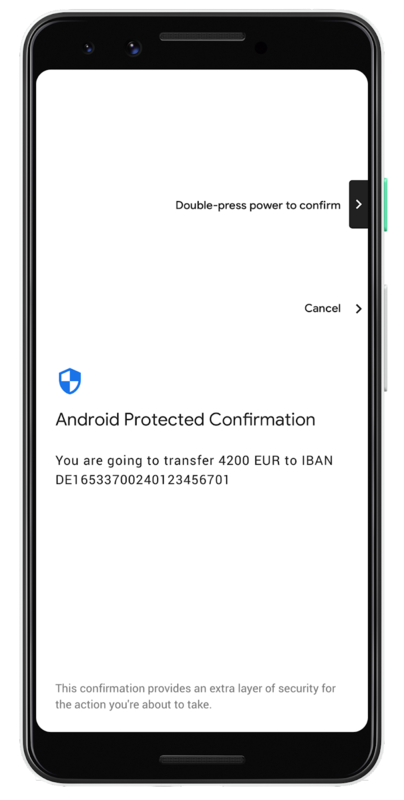 In Android Pie, we introduced Android Protected Confirmation, the first major mobile OS API that leverages a hardware protected user interface (Trusted UI) to perform critical transactions completely outside the main mobile operating system. This Trusted UI protects the choices you make from fraudulent apps or a compromised operating system. When an app invokes Protected Confirmation, control is passed to the Trusted UI, where transaction data is displayed and user confirmation of that data's correctness is obtained. Once confirmed, your intention is cryptographically authenticated and unforgeable when conveyed to the relying party, for example, your bank. Protected Confirmation increases the bank's confidence that it acts on your behalf, providing a higher level of protection for the transaction. Protected Confirmation also adds additional security relative to other forms of secondary authentication, such as a One Time Password or Transaction Authentication Number. These mechanisms can be frustrating for mobile users and also fail to protect against a compromised device that can corrupt transaction data or intercept one-time confirmation text messages. Once the user approves a transaction, Protected Confirmation digitally signs the confirmation message. Because the signing key never leaves the Trusted UI's hardware sandbox, neither app malware nor a compromised operating system can fool the user into authorizing anything. Protected Confirmation signing keys are created using Android's standard AndroidKeyStore API. Before it can start using Android Protected Confirmation for end-to-end secure transactions, the app must enroll the public KeyStore key and its Keystore Attestation certificate with the remote relying party. The attestation certificate certifies that the key can only be used to sign Protected Confirmations. There are many possible use cases for Android Protected Confirmation. At Google I/O 2018, the What's new in Android security session showcased partners planning to leverage Android Protected Confirmation in a variety of ways, including Royal Bank of Canada person to person money transfers; Duo Security, Nok Nok Labs, and ProxToMe for user authentication; and Insulet Corporation and Bigfoot Biomedical, for medical device control. Insulet, a global leading manufacturer of tubeless patch insulin pumps, has demonstrated how they can modify their FDA cleared Omnipod DASH TM Insulin management system in a test environment to leverage Protected Confirmation to confirm the amount of insulin to be injected. This technology holds the promise for improved quality of life and reduced cost by enabling a person with diabetes to leverage their convenient, familiar, and secure smartphone for control rather than having to rely on a secondary, obtrusive, and expensive remote control device. (Note: The Omnipod DASH™ System is not cleared for use with Pixel 3 mobile device or Protected Confirmation). This work is fulfilling an important need in the industry. Since smartphones do not fit the mold of an FDA approved medical device, we've been working with FDA as part of DTMoSt, an industry-wide consortium, to define a standard for phones to safely control medical devices, such as insulin pumps. A technology like Protected Confirmation plays an important role in gaining higher assurance of user intent and medical safety. To integrate Protected Confirmation into your app, check out the Android Protected Confirmation training article. Android Protected Confirmation is an optional feature in Android Pie. Because it has low-level hardware dependencies, Protected Confirmation may not be supported by all devices running Android Pie. Google Pixel 3 and 3XL devices are the first to support Protected Confirmation, and we are working closely with other manufacturers to adopt this market-leading security innovation on more devices.